The Guiding County of Clwyd can be found in North Wales it stretches from Rhos on Sea in the west to the Cheshire border in the east and goes as far south as the Glyn Ceiriog valley. 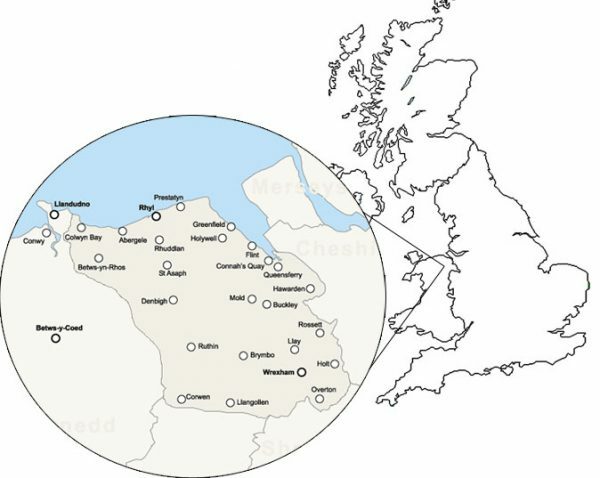 It operates over 4 local government unitary authorities in the North of Wales; namely Conwy, Denbighshire, Flintshire and Wrexham. Girlguiding Clwyd is divided into 7 Divisions, Berwyn, Colwyn, East Flintshire, North Denbighshire, South Denbighshire, West Flintshire and Wrexham. Each Division has a Division Commissioner who co-ordinates activities within those areas. Each Division is divided into Districts with its own District Commissioner or a team who co-ordinate(s) the administration and ensures that Criminal Record Bureau (CRB) checks are carried out for all volunteers for that area. There are 18 districts in all. Clwyd came into existence in 1974. It was formed at the time of local government re-organisation when the old counties of Denbighshire and Flintshire were amalgamated. It still remains as Clwyd although local government has been re-organised and the last political county of Clwyd divided into the three counties of Denbighshire, Flintshire and Wrexham, with part of Conwy. Girlguiding Clwyd now spans these three and a bit counties.